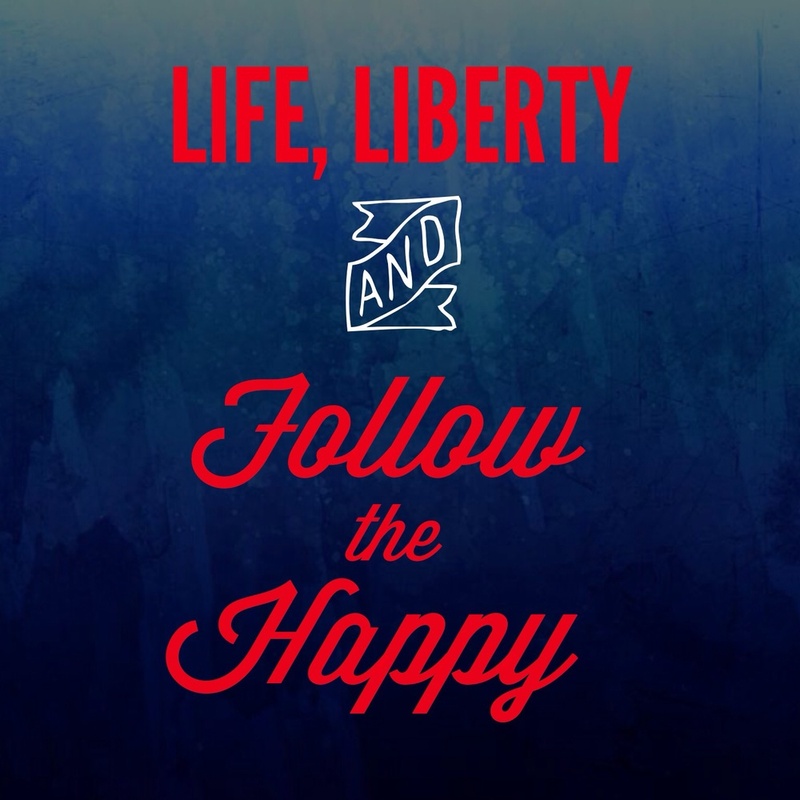 Follow the happy. That's kind of my mantra, but I didn't realize how American that was of me until I got to thinking all patriotic-like for the holiday. The Declaration of Independence promises Americans the right to "Life, liberty and the pursuit of happiness." So why are so many Americans unhappy? Because we all need drugs and prostitutes? No. That document adopted in 1776 protects us against others, but it doesn't protect us against ourselves. No document or law or government can do that, unfortunately. World peace would be cool. But maybe we should start with inner peace and make our way out from there. Break free from the reign of the inner enemies that are at war with our happy — self doubt, lack of self worth, self judgment, unrealistic expectations, stress, ego — all those things we let consume us. It's the American way. It's the human way. We are incredibly fortunate to have our freedom. I don't have to tell you that too many people don't have that luxury. Realistically — although we like to blame others — there are few external forces that are preventing us from following our happy. Yet we take that for granted and forfeit our freedom to our toxic thoughts. I do it. You do it. Oprah does it. We are all guilty of it sometimes (except maybe Buddha). The Declaration of Independence doesn't say, "Life, liberty and happiness." It's the pursuit of happiness. Our forefathers were not guaranteeing enlightenment. They were smarter yogis than that. They helped clear your path, but you have to take it. We can't be happy all the time. Life isn't all rainbows and unicorns. But we can pursue happiness all the time. We just have to let ourselves. So today — because you want happiness, because you want to be a positive role model, because it's your right, because world peace, BECAUSE AMERICA — declare your independence from your toxic thoughts.